In the second installment of our series on tiny kitchens, we bring you space-savers in New York, Hollywood, Tokyo, and beyond. 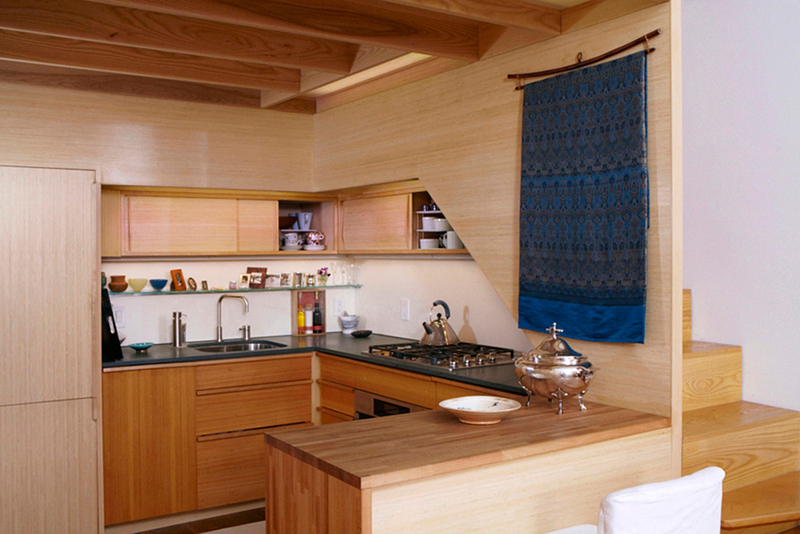 In this truly tiny apartment, a 240-square-foot shoebox of an apartment in NYC with a sleeping loft over the kitchen, architect Tim Seggerman went straight to his toolbox to craft a Nakashima-inspired interior. Photo by David Engelhardt. In most multistory homes, stairs connect floors. But in the 921-square-foot Coil house, located in a quiet residential neighborhood in Tokyo, they are the floors. Defined by 44 steps of varying depths and widths, Coil is a dynamic swirl of continuously ascending spaces, designed by local architect Akihisa Hirata for Sakura and Ryo Sugiura, a young couple with two children. The top of the house is dedicated to a dining area and a kitchen outfitted with steel-topped cabinets from Sanwa Company. Photo by Koichi Torimura. In Tokyo, Japan, where the houses are crammed cheek by jowl, two old friends from architecture school have created a 793-square-foot home out of canted concrete boxes. The resident works from an Alvar Aalto table in the living and dining area, adjacent to the small kitchen against one wall. He saved on some elements, such as the plywood cabinetry, and splurged on others, such as the Finn Juhl chairs and Vilhelm Lauritzen lamp. Photo by Iwan Baan. Where to go in a renovation of a 93-square-foot brick boiler room, built in 1916? Up, of course. For this vertical new guesthouse, architect and metalworker Christi Azevedo deployed Ikea cabinetry in the kitchen, which spans almost the entirety of the renovated building. In lieu of adding standard-issue fronts to the upper cabinets, she created sliding doors of sanded acrylic panels. A PaperStone work top extends from the stainless steel counter for additional prep space. When not in use, the movable dining table—also designed and fabricated by Azevedo—fits snugly beneath it. Photo by Cesar Rubio. This flower shop, art gallery, and home for two looks like the simplest of cubes. Fitting it all into 1,115 square feet, however, prompted Japanese architect Makoto Tanijiri to think outside the box. Custom-made paulownia cabinets and a roomy balcony keep the compact second-floor living-dining-kitchen area from feeling too cramped. Photo by Takashi Homma. David Sarti's little red house in Seattle's sleepy Central District proves that a bit of land, ambition, and carpentry know-how can go a long way. In the tiny kitchen and adjacent living room, every piece of furniture is mobile. The kitchen table on casters can easily slip into hiding if more space is needed, and the chairs from IKEA quickly fold up for easy removal. Photo by Misha Gravenor. Armed with a masters in architecture from Columbia University and only 3 years in the field, architectural designer Alan Y. L. Chan renovated a wreck of an apartment in an early 1900s building on the Upper East Side. The second-floor walkup was just over 400 square feet, with three rooms divided by light-blocking partitions. The apartment opens into the kitchen, which Chan outfitted with a Dornbracht faucet and a sink of his own design. The black steel backsplash doubles as the back of a built-in bench on the other side. A concrete “ribbon” serves as the main design concept and the countertop, and continues throughout the apartment. A built-in LG refrigerator is located just across the concrete floor at right. Image courtesy Brian Riley. Edge Studio's apartment building with its glass-and-steel facade is a glowing example of the urban renaissance that's gripping Steel City. Sleeping space is adventurously tucked away in an alcove above the kitchen, accessible by a track ladder that slides along a rail mounted above the counter. Photo by Roger Davies. When Im and David Schafer moved in together they faced the challenge of combining the contents of David’s 880-square-foot loft and Im’s 550-square-foot apartment into a one-room, 426-square-foot downtown loft. The computer-designed kitchen area has the feel of a ship's galley, with everything neatly stowed, yet visible and instantly at hand: It's much the definition of "ship-shape." For dinner parties, well-worn Eames shell chairs are pulled down by David, with the help of a footstool. "I have nearly an eight-foot reach," says the 6'3'' David. ("It gets a little tough if I have to spend a weekend or so alone," says Im.) Photo by Misha Gravenor. Mad Men’s Vincent Kartheiser has all he needs in his compact, 580-square-foot Hollywood abode. Designer Funn Roberts worked with Kartheiser’s existing appliances in the small kitchen, trading the old cabinetry for new teak. Photo by Joe Pugliese.